FIFA 14 is £62.99 from the PlayStation Store. No that's not the dollar amount. Update: EA has now generously knocked off a whole - get ready for it - £3! This brings the price of its digital PS4 titles down to £59.99, which is still £5 more than its Xbox One games. The Sony PS4 might have won some backers with its cheaper-than-Xbox One price point, but owners look like they'll be giving more of that cash back it they plan on downloading digital games from the PSN. Ahead of Friday's big European launch, the prices and download sizes for launch games has been revealed in the UK, with EA's games coming it at an astonishingly-expensive £62.99. That means FIFA 14, Madden 25, NBA 2K14, Battlefield 4, and Need For Speed: Rivals cost £8 more than the Xbox One digital download and £15.99 more than the physical discs, which are £47 on Amazon. Beyond that, Call of Duty: Ghosts is £54.99, a la the Xbox One version, and Ubisoft's Assassin's Creed IV: Black Flag is £57.99. Both are available significantly cheaper from third-party retailers on disc. Those are the prices currently listed on the PlayStation Store at the time of writing, but with the PS4 still 4 days from official release in the UK, there is a chance that more reasonable prices will be listed on Friday. If anything, over the last few months, gamers had hoped digital downloads would be cheaper due to the dramatically reduced overheads. There are no costs of making physical discs, transporting to stores and no need to give a cut to the retailers, yet we're still seeing higher prices. What gives? As well as discovering their fate in terms of pricing, would-be PS4 owners now know how much space the top games will take up on their PS4's 500GB hard-drive. Killzone: Shadowfall requires a whopping 38.2GB, Battlefield 4 needs 36.4GB and Ghosts will occupy 31.8GB while FIFA 14, NBA 2K14 and Madden 25 need 9.9GB, 9.3GB and 13.1GB respectively. 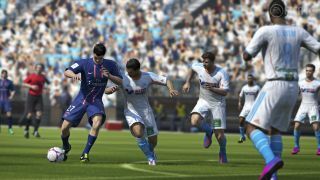 FIFA 14 gives the Xbox One the gaming kick it needs according to TechRadar's Patrick Goss.